England’s Department for Digital, Culture, Media & Sport (DCMS) and the Office for Civil Society have issued a strategy that sets out how government will ‘work with and for civil society in the long-term to create a country that works for everyone’, the first such strategy in 15 years. Civil society refers to organisations and individuals working to create social value, enriching lives and building a fairer society for all. Tracey Crouch, Minister for Sport and Civil Society, unveiled the new vision today, which places communities at the centre of decision-making and focuses on five key foundations of social value: people, places and the public, private and social sectors. The work follows the Government’s Industrial Strategy, published last year. The strategy complements plans to grow Britain’s economy and boost productivity by building a more connected society, where everyone can play their part in a fairer, healthier and more prosperous country. It creates more opportunities for people to actively take part in community decisions, as well as highlighting ways to harness the power of digital and technology for public good. Unlocking £20 million from inactive charitable trusts (those which spend less than 30% of their annual income) to support community organisations over the next two years. The work will be carried out in conjunction with the Charity Commissionand UK Community Foundations. Launching an ‘Innovation in Democracy’ pilot scheme in six regions across the country. This will trial creative ways for people to take a more direct role in decisions that affect their local area. This could include Citizens’ Juries or mass participation in decision-making on community issues via an online poll or app. Establishing an independent organisation that will distribute £90 million from dormant bank accounts to get disadvantaged young people into employment. This new organisation will harness the experience of grassroots youth workers, businesses, and other local services, to help young people achieve their full potential. Creating an independent organisation to use £55 million from dormant bank accounts to tackle financial exclusion and the problem of access to affordable credit. Supporting charities to make their voices heard on issues that matter to them and ensuring that charitable trustees reflect the diversity of the society they serve. Strengthening Britain’s values of corporate responsibility, through the launch of a major new Leadership Group, formed of senior figures from the business, investment and social sectors, to put social and environmental responsibility at the heart of company decisions. Using digital technology for good to improve the work charities can provide to support healthy ageing, bolster online safety and better connect people in an effort to tackle loneliness. Improving the use of the Public Services (Social Value) Act 2012 to ensure that organisations can generate more social value for communities when spending public money on government contracts. Secretary of State for Digital, Culture, Media and Sport, Jeremy Wright, said: Our plans stand side-by-side with the Industrial Strategy, supporting its drive to grow the economy, while creating an environment where people and communities are at the heart of decision-making. These ambitious plans will harness the expertise of volunteers, charities and business to help people take a more active part in their local areas. Tracey Crouch, Minister for Sport and Civil Society, added: Civil society is the bedrock of our communities. It is made up of the volunteers, youth workers, charities and innovative businesses that work to improve lives and make areas better for all. Our strategy builds on this spirit of common good to help create a country that works for everyone. I want people, organisations and businesses to feel inspired to get involved and make a difference. Through collaboration, we will unlock the huge potential of this incredible sector, help it grow, support the next generation and create a fairer society. Business Secretary Greg Clark said: Our modern Industrial Strategy has set out a long-term plan to boost the productivity and earning power of people throughout the UK, building a Britain which is fit for the future. Strengthening the UK’s business environment and growing thriving communities are mutually reinforcing, which is why the Civil Society Strategy is so important in helping to foster further partnerships between government, business, civil society and local communities – bringing improved prosperity across the UK. 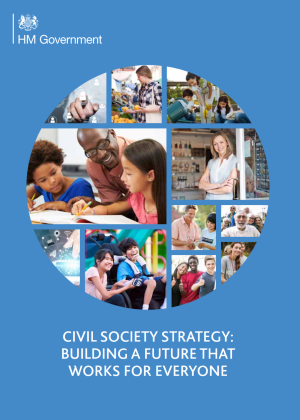 The Government’s Civil Society Strategy was formed following an open consultation and has been developed across Government.